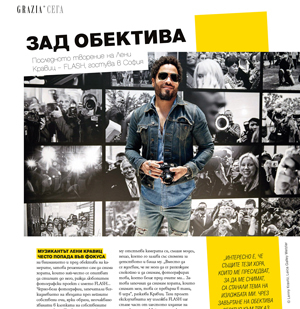 Grazia Bulgaria partnered with Music Foundation and America for Bulgaria Foundation for the event Masters of Photography. The exhibition was dedicated to the rock star Lenny Kravitz and his public life. Lenny has turned the camera and showed the surreal situation of being the focus of attention, constantly facing with a living wall of camera lenses, into a series of photographs. The exhibition, enriched also by images of fellow photographer Mathieu Bitton, presents black and white images that capture the repetitive ritual taking place around him on an almost daily basis. The exhibition, after three previous stops in L.A, Wetzlar and Vienna, arrived in Sofia with also the patronage of VIVACOME, the Embassy of USA, Austrian Embassy and Sofia Municipality. Grazia was special host of this unique event.